Napa Valley is less than an hour from San Francisco. It is the finest wine producing region in the world with that kind of proximity to a major metropolitan area. As such, it gets more than seven million visitors a year. Every one of which goes home thinking, “I could live here. I’d commute into San Francisco three times per week…” That’s why land is so expensive in Napa Valley, and why the County Supervisors have limited Public Tasting Room permits for the last ten years. There are over 600 wineries in Napa Valley, and only 75 of them have public tasting rooms. Other Napa wineries will see you by appointment, but you have to plan ahead. Art and architecture are other unique features of the Napa Valley. It is the smallest of California’s major wine producing regions, but has the most wineries. So they compete with each other to draw visitors off the highway. There are many buildings costing tens of millions of dollars, with elaborate furnishings, wonderful art collections, and massive outdoor sculptures. Tasting at the most famous of these facilities is not like going into a Tasting Room in most other wine producing regions ~ you don’t belly up to the bar, and tell the server which wine you would like to try. You select a program, pay $25 to $100 per person, then receive table service (often with bite-size food offerings) and an instructional experience. Cabernet Sauvignon is king in Napa Valley. They make a lot of very nice wines from other grapes, but nearly half the acres planted in Napa are Cab, and nearly a quarter of California’s Cab acreage is in Napa. There is a reason for this concentration. It’s a crying shame, but it is a fact, you can not take the ferry from San Francisco up the Napa River. Buses take forever; limos are $600 a day. With a car you can visit wineries in the mountains, carry bottles you may purchase, and keep your own schedule. There is just too much to do and see in Napa Valley. You have to focus your attention. Select a topic such as history, or ‘green’ wineries, or women winemakers. Maybe moderately priced Cabs ~ that would be $40 to $65 per bottle. Thumb through a guide-book, or chat with someone in a wine bar, to select five to ten wineries you want to target. Know a little something about them when you arrive. DO spit the wines out. First of all, one of you is driving. Second, you can consume an enormous amount of wine by visiting three wineries a day. It’s one thing to get a little bit lit at a four-hour party, then go home and go to bed. It’s another thing altogether to get lit up at 11:00 am, then maintain that condition all day long. You will get ALL the taste benefit you need by smelling a wine sample, then running it around in your mouth, before spitting it out. If it is not obvious, ask the Tasting Room staff for a spittoon. They will gain respect for you if you do. Swim at the hotel. Walk around a shopping district for an hour. DO take some gear and picnic. Take a couple 8-oz. wine glasses, a cork screw, a small paring knife, and a dish towel. Throw them in your glove compartment. Stop at Oakville Grocery, or Dean & DeLuca, or my first choice – Napa Valley Olive Oil Mfg. Co. for some bread, and cheese, and a little salami. Be sure to grab some bottled water. You’ll find lots of lovely places to relax for an hour and smell the roses. When you look back on the trip, these will be among your favorite moments. Ask your local retail wine store, or a fine restaurant you frequent in a big city, if they can’t make an introduction on your behalf. For wineries that are large enough to distribute, relationships with retailers and restaurants are the coin of their realm. Arriving at a big place with an introduced appointment can spare you many indignities visited upon drop-in consumers. Probably save you some money too. Traffic can be an issue. You’ll probably get lost. I get lost all the time, and I visit wineries several times a week. So leave yourself room for serendipity. Let the good times come to you. Don’t be forced to turn down a romantic adventure because your itinerary is too tight. Three wineries a day maximum, plus picnic, exercise, dinner, cultural opportunities, short nap in the shade. This is vacation; it shouldn’t feel like work. DON’T forget your shades, hat, shoes, jacket. You are going to be in the sun in dusty vineyards. Then you are going to be in 55ºF wine cellars with wet floors. Plan on being comfortable. Everyone will enjoy you much more if you do. DON’T go in September during Harvest. Too hot, too much traffic, wineries too busy, hills are all brown and parched. Everybody is charging extortionate rates. 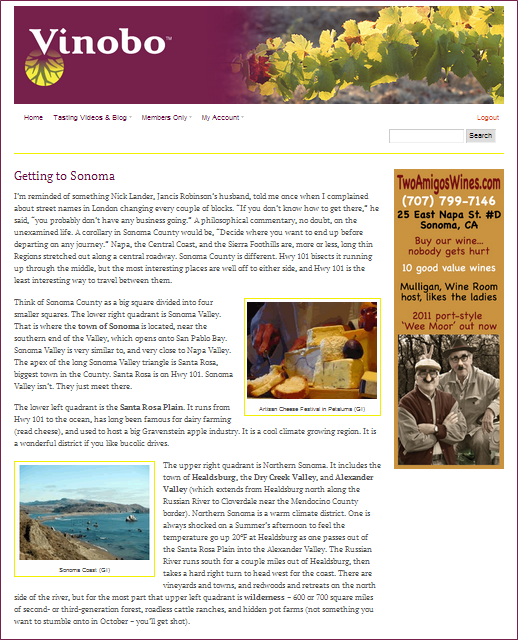 Go in the Spring: more comfortable, more affordable, prettier, wineries much more hospitable. DON’T believe everything winery people say. Employees doing presentations at wineries have a dog in the fight. They may be very knowledgeable, but they are not objective. Listen to everyone, compare their opinions, then arrive at your own conclusion. There are lots of controversies in the Wine Biz. DON’T assume price is synonymous with quality. A lot of wines are expensive because they are rare. Others are expensive because the winery owners are captains of industry used to drinking expensive wine (you’d be amazed how much of your own wine you end up drinking for promotional purposes when the winery belongs to you). By contrast, some brilliant wine is modestly priced because the property has been owned for three generations by local folks who think of themselves as farmers. Or it may have been produced by some young winemaker as a project on the side while he works for a big-name brand.